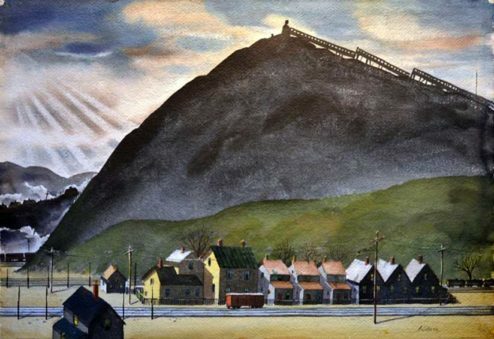 Painter, lecturer, teacher, illustrator and author, Henry Gasser was born in Newark, New Jersey on Oct. 31,1909. He lived, studied and worked in New Jersey for his entire life. A Master at watercolor and oil his work consisted of, in his own words, “everyday subjects that are available to most of us-street scenes, back yards, trees, old houses, etc I looked for them in front of houses, in backyards, public parks, and elsewhere”. He also painted numerous harbor and fishing village scenes. His work demonstrated a sense of place and feeling that most could identify with. He often “exhausted a subject” which becomes evident when viewing the body of his work for many of his paintings are just slight variations of previously completed compositions. His Paintings also contain a great deal of what he called “solitary silence” created by chosen subject matter such as a “Coming Storm”, “Night in the Park”, “Shadows”… He felt that Design was very important and meant the difference between a mediocre work and a truly professional one. It is here where Gasser excelled, his work demonstrates a sense of composition that gained wide spread appreciation for his work. He got his background in art studying at the Newark School of Fine and Industrial Art and the Grand Central School of Art. This was followed by study at the Art Students League of New York in the classes of Robert Bracman. He later studied privately under John R. Grabach. He is represented in over fifty museum collections and numerous important private ones as well. Among the awards that Henry Gasser has received are the Hallgarten Prize at the National Academy, the Zabriskie, Osborne, and Obrig prizes at the American Watercolor Society, the Philadelphia watercolor club prize, the Allied Artists Gold Medal at Oakland, California and many others. He was a member of the National academy of Design, the American Watercolor Society, the Royal Society of Art (Great Britain), the Salmagundi Club, the Philadelphia, Baltimore and Washington Watercolor Clubs and the New Jersey Watercolor Society. He was a life member of the National Arts Club, Grand Central Art Galleries and the Art Students League and others. He served as Director of the Newark School of Fine and Industrial Art from 1946-54 then continued lecturing and demonstrating for most of the remainder of his life. He also wrote numerous books on painting. He died in Orange, NJ in 1981.